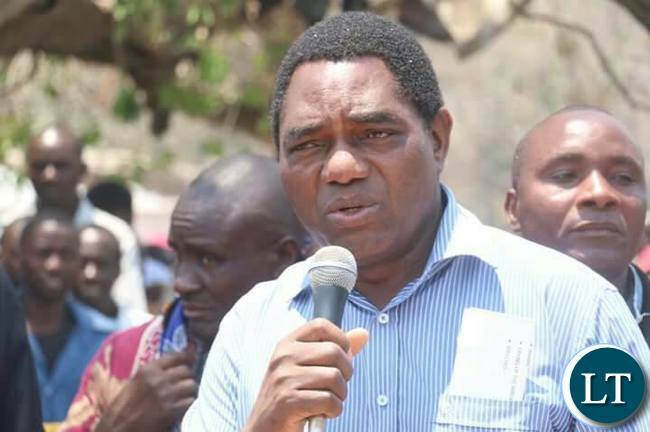 The Lusaka High Court has ordered UPND leader Hakainde Hichilema and the State to inform the court whenever they will be ready to proceed with a case in which the UPND leader has gone to court regarding his dismissed Presidential election petition. In this matter, Mr. Hichilema has gone to the High Court claiming that his right to be heard was violated when the constitutional court threw away his petition. Last time, the matter was adjourned at the instance of the petitioner’s lawyers. But the High Court has ordered that the court should be moved by Lawyers representing both parties so that new dates for the status conference, which will give directions on how the matter proceeds can be set. High Court Judge Mwila Chitabo issued the order upon receipt of the consent order to adjourn the matter. Judge Chitabo said he cannot set a date in the absence of the parties representing Mr. Hichilema and the respondent who in this case is the Attorney General. He said he is doing this because he was not availed with the grounds of adjournment by the two parties when they made an agreement. The case went back to the High court after the Supreme court threw out Mr. Hichilema’s appeal in which he wanted Justice Chitabo to recuse himself from handling the matter for alleged bias. The Supreme court dismissed the appeal on grounds that Mr. Hichilema and his Vice President Geoffrey Mwamba had used a wrong mode of appeal as they appealed straight to the Supreme Court instead of starting with the Court of appeal. The Justice and judiciary systems in Zambia are a big joke. Look at hoe Kenya and Zimbabwe expeditiously dealt with their cases. Margaret Mwanakatwe and Nkandu Luo had their seats nullified over a year ago and the clowns disguised as Constitutional Judges are yet to rule on their appeal!!! Anyway, when Edgar himself was debarred for stealing from a widow……. This is what you get from rigging, lack of integrity! In January, 2018, Government and Donors released over 84 Million to pay september/october, 2017 transfers the 590,000 households countrywide and ZAMPOST was tasked to pay 5 provinces namely Western, Luapula, Muchinga, Northern and copperbelt.Unfortunately, ZAMPOST used the funds meant for the poor to buy vehicles and beneficiaries have not been paid the September/October, 2017. This has not gone well with the donors who have since withheld the funding to the programme demanding that ZAMPOST finds money to pay beneficiaries or they pull out of the programme. After the court case, or when the case will be held. HH will go to Southern Province and tell his followers that he won the election. He is the president. He was given 14days as the law requires. But he ignored the due process, due to his pomposity and arrogance. kainde knows he is forum shopping. This matter is going nowhere and will DEFINITELY not take him to plot 1!!! Sadly his emotionally chargerd blind and irrational supporters still believe this case is viable. Stop stealing votes period. Elections have now become a circus, no person of a sound mind should participate in them. Unless he or she want to legitimise fraud. yaba kuti wanaka nokupembela mwandi. Ngati nimu kazi wako unga peze bamupasa kale namimba 3yrs down the line. iyi manje iliko tricky kaili Judge Ali bias as already claimed so whatever the outcome sibazavomela…give us iwe. @4 Aliko.. PLEASE READ THE ARTICLE CLEARLY, BOTH HH and State Lawyers seem not to take this matter seriously!! The article says: “Judge Chitabo said he cannot set a date in the absence of the parties representing Mr. Hichilema and the respondent who in this case is the Attorney General.He said he is doing this because he was not availed with the grounds of adjournment by the two parties when they made an agreement”. THE BALL IS IN THEIR (mostly HH’s) COURT and NOT the judge’s!! Surely, this is an academic exercise. It will not even add anything to his fortunes if at all has some. Which right to be heard Akainde?? Work up and start cogitating like a leader of an organization not like brat! it is not about going to state house but about setting a precedence. what happened after the 2016 election should not happen again. it is for the good of all Zambians not just HH. Zambians must get some lessons and not put a cheap thief (convicted thief) to be in charge of the country’s resources. Very true, precedence. What happened in 2016 where people rush to court to spite the winner of elections, as chosen by majority Zambians, with no evidence should not happen again. Then the precedence of smearing and destroying the name of those who have achieved more than you is retrogressive and shows how incompetent our opposition is, they should channel their energies into formulating strategies that will inspire the masses to choose them instead. Which precedence when the man won clean game. HH assembled a team of lawyers who thought 14 days was actually 14 years. Then today you want hide in precedence. Any way uwawa tabula kabepesho. But on the other hand i support you because judges need to way for their salaries………so they need to be kept busy. But let both HH and Govt be in court. Since the case was taken to court to can only be resolved in court. Why are these two parties not going to Court? @6 Kaputo.. YES, like @6.1,6.2,have said, what happened in 2016 should NEVER REPEAT IN EVERY SENSE!! Let the losers accept their losses instead of wasting time in “face saver court cases” we have also seen in Zim!! IF HH IS SERIOUS ABOUT IMPROVING DEMOCRACY LET HIM MOBILISE HIS PARTY,OTHER OPPOSITION AND CIVIC ORGANISATIONS,INCLUDING THE “INTERNATIONAL COMMUNITY(Which he loves alot)” TO ADDRESS CONSTITUTIONAL, ELECTORAL ISSUES THAT COULD AFFECT THE CREDIBILITY OF NEXT ELECTIONS instead of staying fixated on issues that are now water under the bridge!! SATA MOBILISED TO EXTEND VOTER REGISTRATION TO BRING MORE OF HIS POTENTIAL VOTERS ON BOARD and HE WON!! Its neither the time it has taken here, its neither the issue of mkazi being with mimba, its neither the issue of a cheap thief. The issue here is justice which will be determined by the courts. HH should not be demonized for going to court and Edgar Lungu should not be demonized for being sworn in. HH did the most civilized thing that a normal man should do, if aggrieved, go to court. What is difficult pamene apa? …what is difficult is ana enda ku court with no evidence, that’s quite daft, no??? HH nakota mwebantu. This is the guy who used to tease others like late President Sata that he was old, but then look how time has caught up and equalized things for HH, too bad. Politics is not toddlers. So its true that conventions in UPND have been scrapped? Oh, my foot. Kaponya (HH) is a finished thug with nothing to offer the masses. He’s deceiving the UPND by pretending there are credible cases before the courts of law. He has a small brain. The right to be head or to play after 90 minutes has elapsed ? Sheer waste of time. Hatred is now being extended towards judges. Unless HH sets himself free, he will remain imprisoned in heart. Why is he afraid of Chitabo? You don’t institutioms which has remedy. You don’t insult institutions which has remedy!!!! No convention until court hears Adolf! But it will back fire unlike others we shall not leave the ichipani we shall remain but votes beyond certain sectors nchiyumu! We shall decampaign after all we are already in parliament so delay the convention until you lose again in 2021. Justice delayed is justice denied. All those who condemn those who seek justice are blinded. There is need to correct the wrong going on in this once noble country. Ofcourse one would not be surprised with some sentiments because their background is from the streets and there is no law on the streets because those on the streets run away from regulated ways of doing things- breaking the law with impunity. The thing is they don’t care about who is hurt. MHSRIEP, a gallant Zambian whose legacy must go down in the encyclopedia and history books. Alas, this country has been captured by a few selfish and arrogant individuals who repel and demean the church when things are on their side but go acting to be humble and holier than thou when they need their (church) support. How foolish are we as Zambians? We have a Court of Appeal now, do we? Comment:I hope this case goes on till PF is booted out of power. Yes every one has the right to be heard to clear the air so that justice prevails. Right to be heard in Namwala. let’s give lungu another term and dance a lot of dununa reverse. we are id1ots who are used to mediocrity. you enjoy suffering bafikala. Iwe ka Moffat, don’t insult ala. And by the way what is your real name, Mambala? The id1ots you are calling arr the UPNDs, right? HH is good to the TRIBAL H-ORGANISATION he represent not to Zambia. THE RIGHT TO BE HEARD IN A PRESIDENTIAL PETITION ONLY APPLIES TO THE 14 DAYS. AFTER THAT, THAT RIGHT IS FORFEITED AND BECOMES INAPPLICABLE. YOU HAD THAT RIGHT IN YOUR 14 DAY SIR BUT YOU BUNGLED IT. PF and UPND delaying the courts. What else is new? The Zambian courts are diligent, but these two parties are always Politicking, holding their poor supporters and cadres hostage. Let us move on to Zambia’s development, not this. Advice to HH:first,you contracted very dull lawyers.what you should have been fighting is not the right to be heard but judgment of the case,whether at preliminary level or not then from that you appeal because any case before the courts,judgment is there. How can you get judgment without being heard but some people. Iwe,14 days,they were in court,what was there 14 days,sleeping or dancing? Comment:all we need is peace ladies and gentlemen! we also need to migrate from a rudimentary type of politics to the civilised one so as to maintain our Christendom! aren’t we all in one Zambia one one nation you hypocrites! who deceives you that you should be infringing on other pipo s political affiliation rights! let’s not entertain the devil by insulting one another like pipo with no brains coz we are all Christians unless u deny that! me I like both hh and Edgar coz they are all Zambians! and I oso intend to b the president of this country in 2031.I know I will win coz I posses the leadership qualities Zambia needs!